Have you gotten on this bandwagon yet? I have and I L♡VE it! 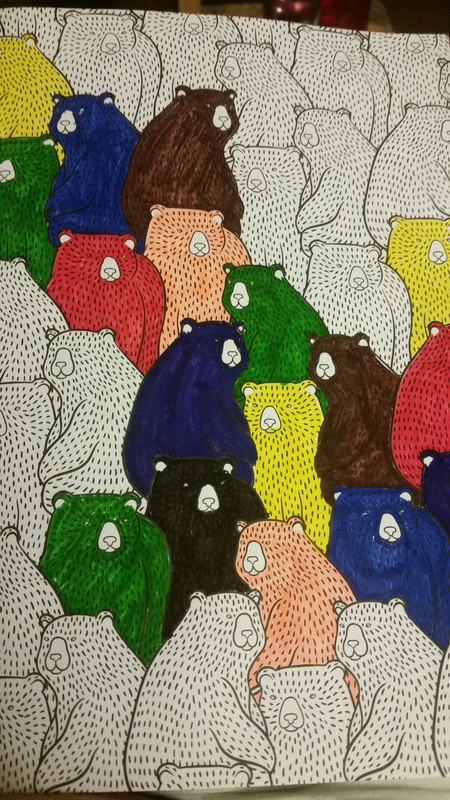 A few weeks ago I went to an coloring event at my local library – I even skipped my weekly knit night to try it! ::gasp:: I remember being in a real funk that night, but coloring a really bizarre rabbit got me feeling much better. I now have two coloring books – one on floral mandalas and one on animals – and a variety of coloring tools. And yes, it is very likely that I might have snatched some of my toddler’s art supplies. But only because I believe the crayons and water colors are better used as intended as opposed to being eaten or shoved up a nostril. So fun! I got a set of brush-like markers at Michael’s and this was a perfect image to try them out on since the tips are more flexible than my pens and pencils. I’m excited to finish it. If I’m sitting, I’m SPINNING! Hooray! I have finally learned to spin! For the past 5 years or so the spindle and wheel have intrigued me. I was very reluctant at first to learn how to make my own yarn. I always thought that I had enough projects to keep me busy knitting. Why should I bother making my own yarn when I can buy it at the store all ready made? Then I realized that is what non-knitters say about socks and sweaters and everything else we enjoy creating. So I gave it a try and failed. Bought a spindle kit with some fiber at a festival and failed. Sat in with some spinning guild members at a festival and failed. Tried watching some tutorials on the Internet and failed. Bought a few books on how to spin and still failed. There was a lot of time passed between all of these attempt, and after each try I started to think it just wasn’t for me. Then, a few weeks ago I got a newsletter from a LYS offering to teach a mini session on spinning. I always wanted to sign up for a spinning class, but most often it is taught on a wheel and way out of my price range. This was affordable and I was the only one that signed up, so I got the instructor’s undivided attention. I couldn’t believe that after two hours I was spinning – rather wobbly – and making my own yarn! I guess all those failed attempts over the year helped to create a weak muscle memory on my fingertips. And the reading, research and discussions helped me to become familiarized with some of the terms which made the class less intimidating. Plus I got to walk away with a CD spinner and some merino fiber to keep practicing. It is surprising that it’s coming out so well, even if it is thick ‘N thin yarn. Every spinner I’ve talked to says that the bumpiness of your first spun yarn is impossible to recreate so I should embrace it as art yarn. I’m excited to finish it and figure out how to ply it so I can knit myself something with it.